If there is one nation that takes pedestrian safety and traffic laws seriously, it is the Germans. Last month the Bavarian city of Augsburg installed a series of traffic lights into the pavement at several intersections with high foot traffic. Their reasoning? 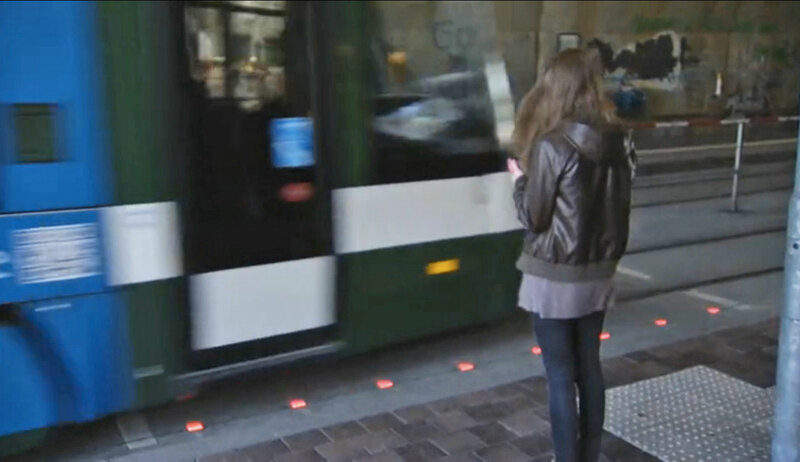 Following the death of a teenager who walked in front of a tram while texting on her phone, city officials figured these new lights in the sidewalks would keep pedestrians who couldn’t be bothered to look up from their phones informed about crossing signals. Crossing signal lights in the pavement in Augsburg, Germany. Source. The idea may sound a bit hokey, but Augsburg is on the cutting edge of civil engineering when it comes to a now pervasive phenomenon of modern life: people spend a whole lot of time looking down at their phones. What’s more, it takes considerable effort to get them to look up. One study showed that 60% of adults prioritize their smartphones over walking and linked this phenomenon of “distracted walking” to a recent rise in pedestrian injuries and fatalities. We can bemoan this phenomenon all we want, but all signs point to it being here to stay. 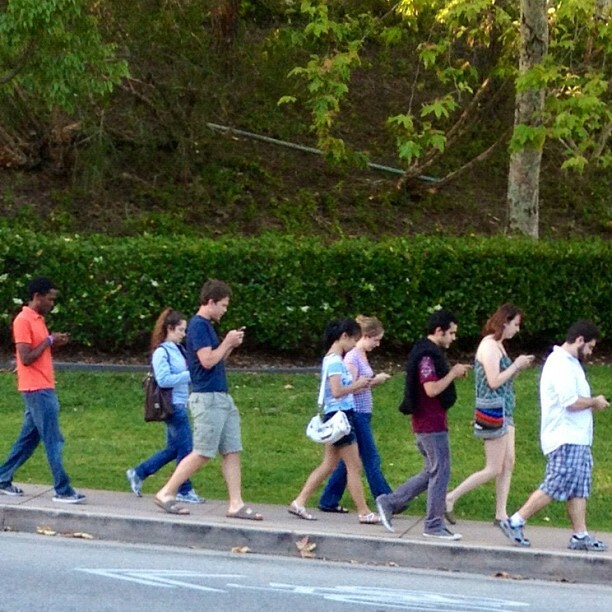 A wild pack of distracted walkers appears. Source. But safety concerns aside, there is an important marketing lesson to take away from our German friends’ efforts to keep traffic flowing smoothly. One of the most underutilized advertisement spaces in today’s world is right beneath our feet. 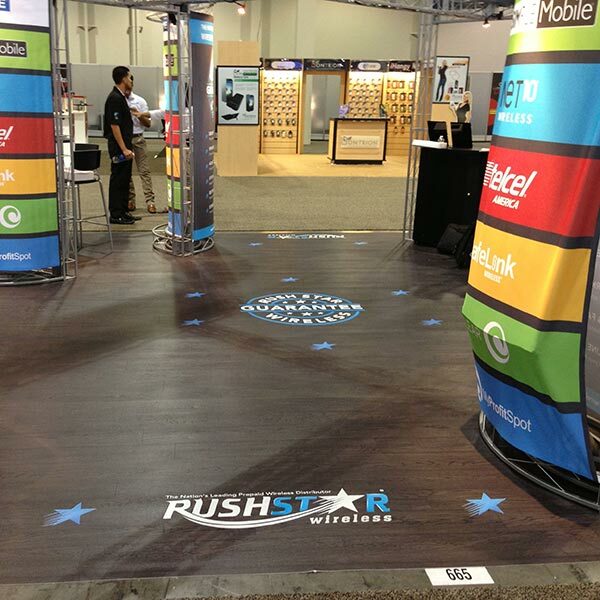 Here is why you might want to consider floor advertising in your next marketing campaign. Heads up! Your customers are looking down. Americans spend 4.7 hours a day looking at their phones. But they’re not just looking at their phones, they are looking at their phones while doing everything else: eating, commuting, driving, exercising, walking, you name it. Competing with a smartphone for the attention of a customer (or anyone, really) doesn’t seem quite so daunting when you keep in mind that the average person is actually quite used to multi-tasking with a phone in hand. You just can’t always expect them to look up. Floor decals are not the newest product on the market, but they are now more relevant and useful than ever. If it strikes you as somewhat lowly to put your brand’s logo on a floor or sidewalk, it may be time to reconsider. Given the rising likelihood that a consumer’s head will be tilted downward at any given time, the ground we walk on may be just the space to get your brand in your customers’ line of vision. If your goal is to get customers to actually see your message, start brainstorming some floor sticker marketing ideas for your next print campaign. A floor advertisement is placed exactly where your customers will see it. Custom Floor Decals by Coastal Creative. Beyond working in tandem with consumer phone habits, a floor sticker marketing campaign can come with a whole host of advantages. Capable of being cut to most any size or shape, they are incredibly versatile. 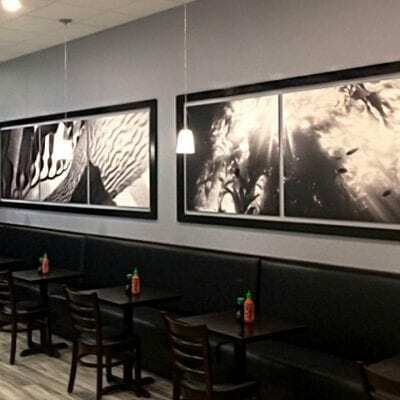 The low cost and unimposing 2D nature of a floor advertisement makes it possible to place large sizes and quantities in any given space without obstructing foot traffic or breaking your budget. That means you can put them exactly where people are walking, and not in some distant corner. Easy to apply to both textured and smooth surfaces, floor decals are just as easy to remove and cause no damage to the original surface. Laminated with slip-resistant coating, there is no danger that a floor sticker will cause accidents (distracted walking, aside). Floor stickers are safe and non-slip enough even to be used as dance floor decals. And while concrete graphics and other floor stickers may not last forever, the bright side is that the faster they get worn out, the better they are working. Here are some floor sticker ideas and examples to get your creative juices flowing. Another way that concrete graphics or floor stickers can engage your customers is by fantastically transporting them to a destination of your choosing. 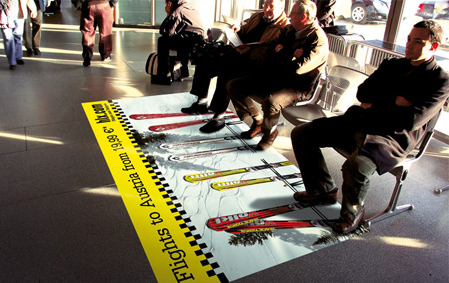 Use floor advertising to set the scene for an epic vacation and let your customers’ imaginations do the rest. Consider floor sticker marketing ideas that employ clever placement and an element of escapism, especially where there isn’t much else for your customers to be looking at. Waiting areas are the perfect place for your customers to ponder your floor stickers. Public transportation is another great place for a floor advertisement. For those dreaming of a ski vacation. Source. The 2D nature of a floor sticker doesn’t preclude 3D effects. 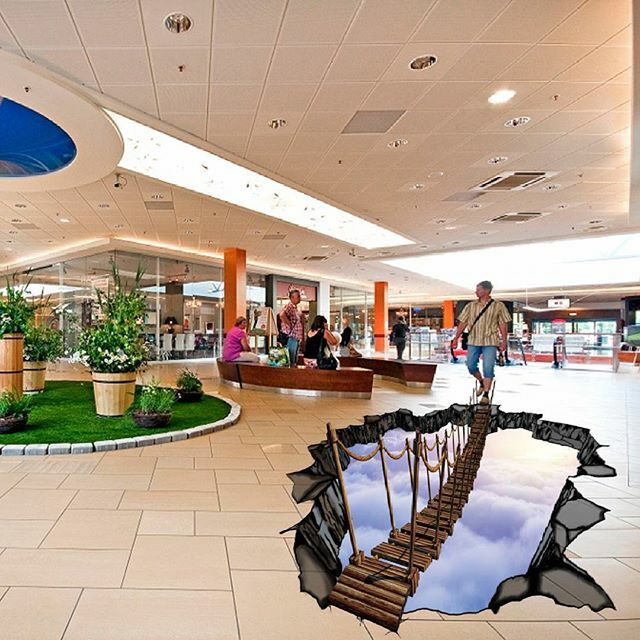 Making creative use of perspective, a floor decal can appear as if it were popping out at your customers. Done correctly, the effect can be visually stunning. Not to mention, floor advertisements can be incredibly engaging. Say good bye to customers walking by your message without even seeing it. With creative floor sticker marketing, your customers will will making a point to walk right through them. Maybe you’ve noticed a certain downward trend in photos shared via social media. Sister to the selfie, there is no denying that people often take photos of their feet. This is not much of a surprise given that their phones and attention tend to be pointed in that general direction to begin with, but this trend does bode well for your floor sticker marketing campaign. A combination of clever placement and the right footwear on the part of your customer can lead to plenty of likes and shares. Clever floor sticker ideas are ripe for sharing! 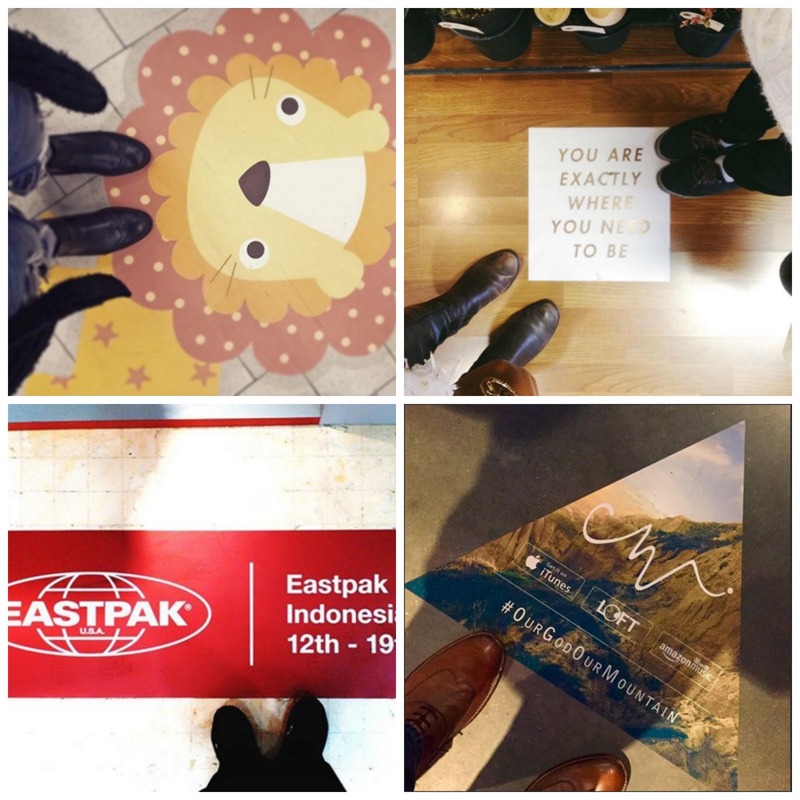 Consider employing floor advertising that is highly attractive and engaging, and it may be photographed and shared even further. Cool kicks and even cooler floor stickers. There is a certain impressive novelty to high-flying advertising like aerial banners or tremendous bill boards. But given that the average customer’s vision isn’t oriented upwards, these high-profile marketing tactics may be on their way out. 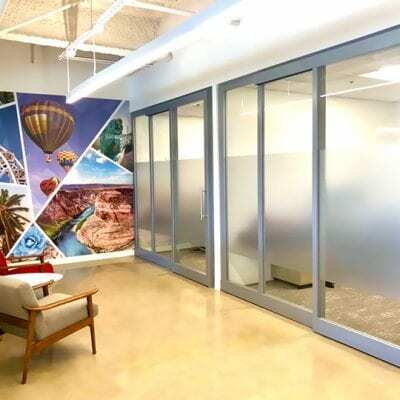 Aside from some serious cost advantages of floor sticker marketing, floor advertising with decals makes creative use of the high traffic spaces we too often take for granted. The ground we walk on could be the next great frontier for print advertising and sticker marketing campaigns. I do have to agree that floor decals are fairly effective at getting my attention. It’s probably because I’m so used to looking down while walking. I would certainly notice a decal like the fake bridge you have posted. Chances are that I would also have to take a picture to share with my friends and family. AKA free marketing for whoever put the decal down. Open M-F 9 a.m. - 6 p.m.